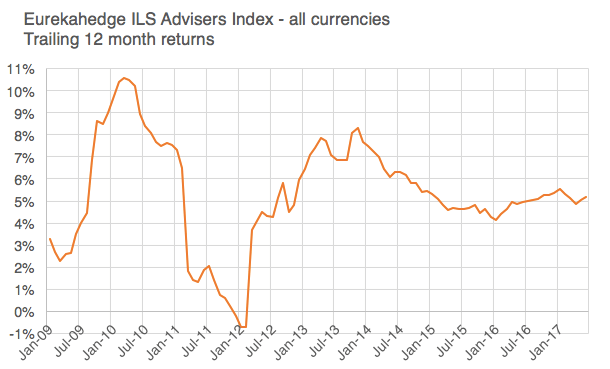 Deteriorating market conditions have not put off investors who continue to pour money into ILS funds. 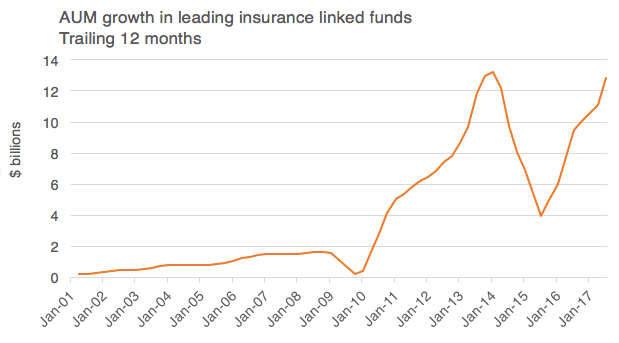 The AUM of the largest ILS funds grew by $13 billion over the last year. Here are five charts on the current state of the market. 1. In the year to June 2017, AUM growth was close to an all time record. The 21% increase is partly due to organic growth of a larger capital base, but mostly due to net investor inflows. 2. Fund returns appear relatively stable but have been flattered by several factors which are masking the continuing slippage of underlying risk-adjusted returns. These include the spike in short dated treasury yields; the mark-to-market gains of catastrophe bonds and an absence of large losses. 3. 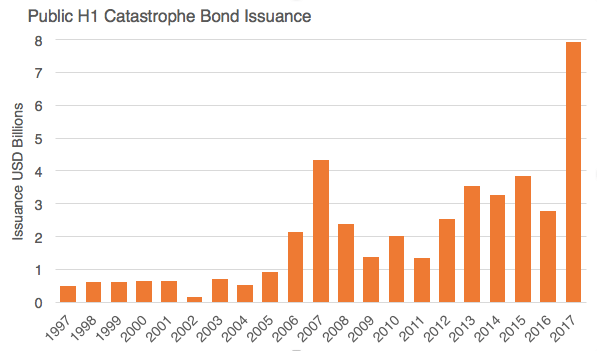 The first half of 2017 saw $8bn of new catastrophe bond issuance – close to triple the issuance in the same period last year and by far the largest in the history of the market. 4. However the effect on the amount of outstanding catastrophe bonds was more modest due to record redemptions and the increasing tenor of bonds. The average cat bond coupon for bonds issued in the twelve months to June 30 2017 reached a ten year low of 4.6% – down from 6.3% in the 12 months to June 30 2016. This has meant that the payments available to investors have remained level as the total market size has grown. 5. 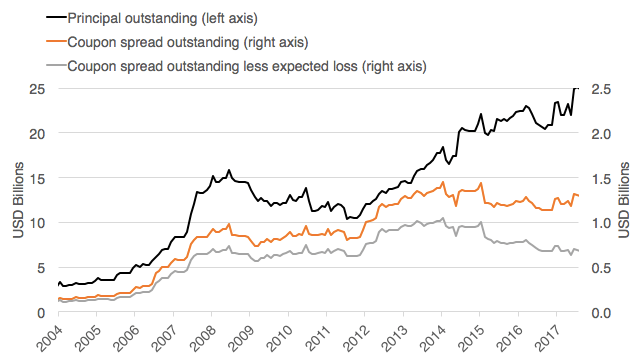 Risk-adjusted pricing has also continued to drift downwards. 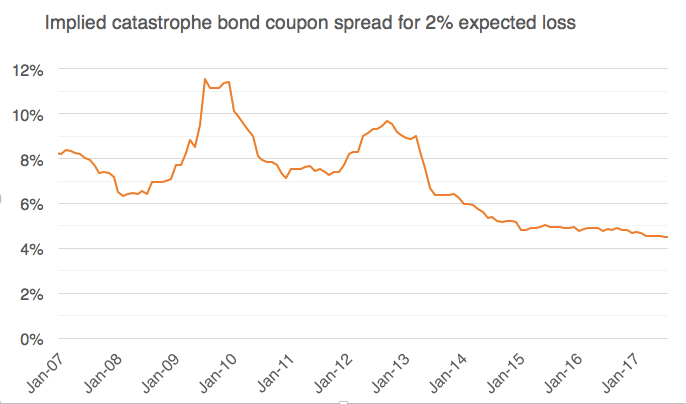 A 12-month regression analysis indicates a coupon spread of 4.5% for an expected loss of 2%. True risk-adjusted pricing is likely to be further compressed by the latest batch of catastrophe models which have concluded that losses from natural catastrophes are less likely than previously thought. To read more articles like this one, visit InsuranceLinked – the online resource for catastrophe bond and insurance linked investments. Hedging Hurricanes – a concise guide to reinsurance, catastrophe bonds and insurance linked funds is now available in print and on Kindle.